Saina Nehwal wins opening game! Sourabh Verma loses 19-21, 21-14, 20-22 to China's Ka Long Angus in second round of Indian Open. Agony for Sourabh Verma who lost two games after being just a point away from winning them. Nonetheless a valiant effort from th Indian against a strong Chinese opponent. World number 4 Viktor Axelsen seals passage to the Indian Open quarterfinal with a comfortable victory. He was dominant from minute one and didn't give Kidambi Srikanth a sniff. The Indian lost the match in the first game when he was blown away. He did show some resistence in the second game but Axelsen was just in a great rhythm. BIG QUARTERFINALS ON THE CARDS! So we will have three Indians in the quarterfinals of the 2017 Indian Open. 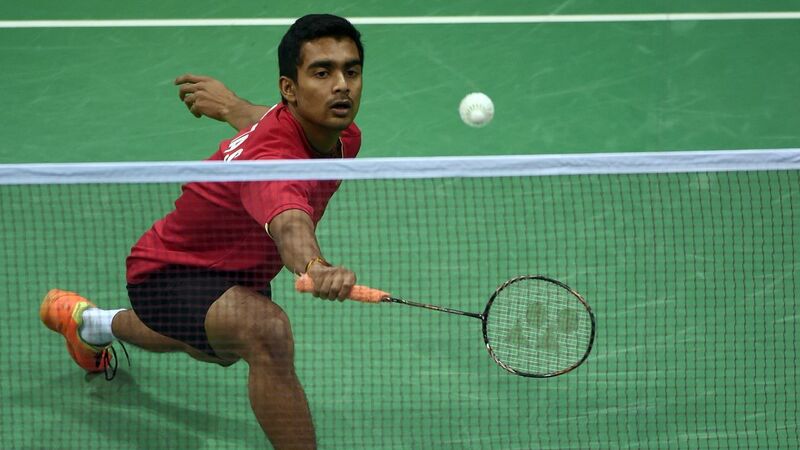 Sameer Verma is the last Indian standing in the men's singles after a brilliant performance today. But all eyes will be on the two women PV Sindhu and Saina Nehwal who will face off in the quarterfinals on Friday. It promises to be a huge QF day at the Siri fort in New Delhi. Top two seeds Sung Ji Hyun and Carolina Marin will also be in action on Friday. However India's challenge in both men's and women's doubles is over. 22-21! Sindhu has another match point. Can she seal the win this time? ERROR from Sindhu! Rush of blood from the India. 20-20 now! 19-18! Sindhu has the lead. Can she make the pressure count now? PV Sindhu has turned it around! Saina vs Sindhu in the quarterfinals? Saina Nehwal was in complete control today. Smashes, drop shots everything in full flow. 3-0! Saina makes strong start! Saina Nehwal has hit the ground running. With the crowd behind her, she wants to put the pressure right on her opponent from the word go. Can the Indian youngster stun the World No 4? Sourabh Verma took the game right down to the wire against sixth seed NG Ka Long Angus. Great effort! Yes indeed! Sameer Verma leads 15-12 in the opening game against Yun Hu, while Sourabh Verma has a 14-13 lead in the deciding game against Ka Long. Can the Verma brothers finally give some joy to the Indians? Preview: Indian shuttlers enjoyed a successful outing at the India Open 2017 badminton tournament on Wednesday with most of them sailing through to the second round. Sameer Verma created one of the biggest upsets of the day when he stunned World No 5 Son Wan Ho of South Korea 21-17, 21-10. He found his rhythm early in the first game and did not let the Korean play the attacking strokes that he is known for. Sameer has now set up a relatively easy clash against Hong Kong's unseeded player Hu Yun in the second round. "I am just taking one game at a time, and do not want to be complacent about facing an unseeded opponent. I am just looking forward to tomorrow's match," an ecstatic Sameer said after the win. B Sai Praneeth, who played against Kento Nishimoto of Japan, had to fight it out for three gruelling games before coming out on top. The 23-yr-old Indian was surprised by the range of strokes that his opponent had, and had to slow down the pace of the game to unsettle Nishimoto. "Kento is a tricky opponent. He is a really good player and I had to play my best game to win the match. That's how difficult it is to win a Super series game," Praneeth said. 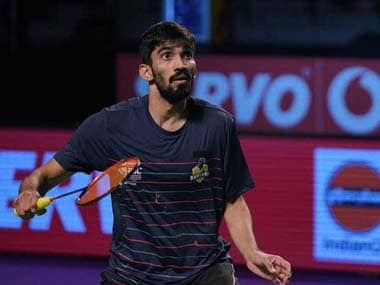 It was however, a routine affair for Kidmabi Srikanth who got the better of his Chinese opponent Jun Peng Zhao 21-19, 21-16 in straight games. Incidentally, Peng had beaten Srikanth in the opening round of this year's All England Superseries Premier. Srikanth is expected to face a tough battle in the next round as he will take on top seeded Viktor Axelsen of Denmark. In the women's section, all eyes were on Saina, who is on a comeback spree after a knee injury that she suffered after the Olympics. The Hyderabadi made short work of Taiwan's Chia Hsin Lee to clinch a 21-10, 21-17 verdict. With victory in sight right towards the end of the second game, Saina conceded seven soft points, otherwise the margin of win would have been more convincing. Saina displayed some calculated movements on the court which proved to be too good for the Taiwan girl. 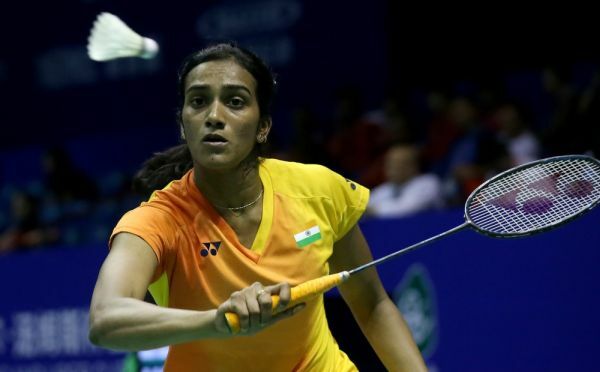 Another Hyderabad girl PV Sindhu brushed aside fellow Indian Arundhati Pantawane 21-17, 21-6. The third seeded Sindhu proved to be too good for her opponent and did not give her any opening as soon as the second game started. Earlier in the day, World No 53 Rituparna Das got the better of Taiwan's Mei Hui Chiang, and won 19-21, 21-15, 21-19. She will run into top seed Carolina Marin of Spain in the second round.